Pearson International is now host to Terminal Zero One, an interactive digital arts exhibition curated by David Jhave Johnston and Michael Alstad. The T01 kiosk consists of five LCD exhibits, four of which are interactive, that gives travelers (and the public, since it's pre-customs) to re-imagine the way they interpret air travel and airports. I visited the exhibition during its launch on Canada Day yesterday, and had a chance to speak to some of the artists about the works they had put together. There's a wide variety of takes on air travel from international security and human rights to the many icons and symbols we see throughout the airport. Keep on reading for plenty of photos, a summary of the works on display, and where to find this exhibit at Pearson International. Dual Term, by Erik Adigard and Chris Salter, aims to explore the way travelers move through the airport environment, and presents an interesting juxtaposition of noise and silence. 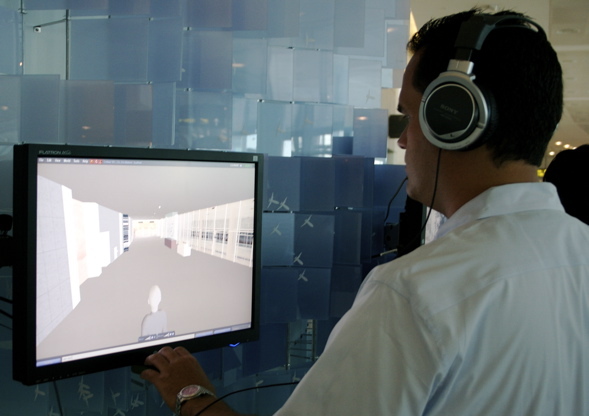 The space in which T01 exists is simulated through the online world of Second Life, and with the help of headphones, you're immersed in the hustle and bustle sounds of air travel as you walk your character along the terminal. 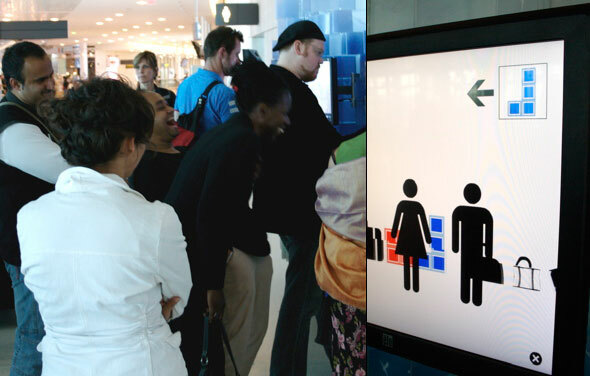 Arrivals and Departures, by Daniel Shiffman, is one of the more fascinating concepts on display in that it takes a commonly used arrival and departures panel, and equipped it with a motion-sensitive webcam that causes the display to morph and animate based on the viewer's movements. It also presents this interesting association to the floating cube artwork of Terminal One that the exhibit faces; the animation when the display is distorted plays on the way the cubes float around in Ingo Maurer's water sculpture behind the display, as shown in the photo above. K.D. 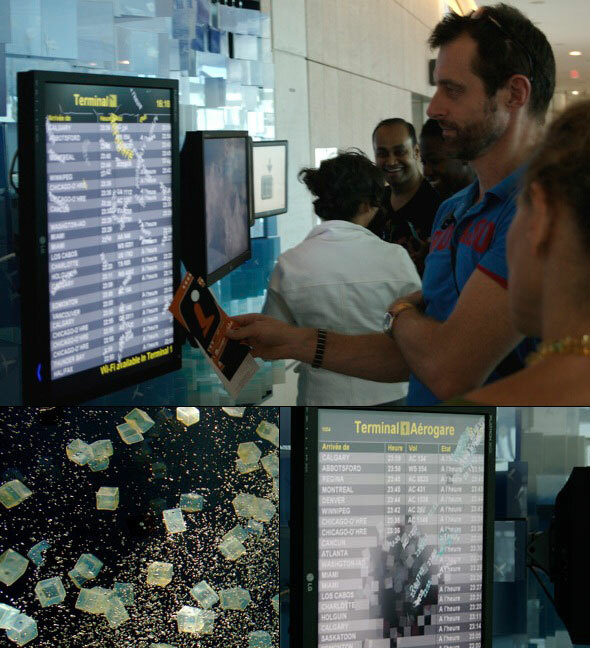 Thornton put together a piece called ETA, which has another take on arrivals and departures. 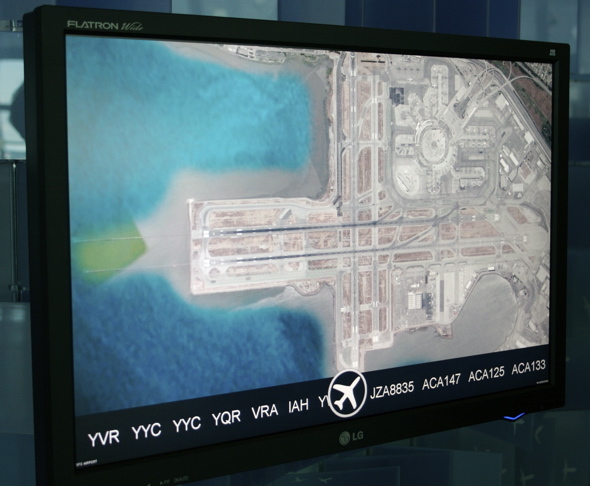 ETA scrolls all flights to and from Pearson across the bottom of the screen, while simultaneously flashing images of the destination airport in the above portion of the screen (San Francisco International Airport shown above). While this piece isn't interactive, it had a way of almost taking the viewer on a trip of their own to the various airports flashing by on the screen. Passage Oublie was by far the most controversial and though provoking piece at T01, put together by Maroussia Levesque, Jason Lewis, Yannick Assogba, and Raed Mousa. Passage invites viewers send messages either by Web or SMS with their thought on rendition flights, "a detainee-transfer practice where people, currently mostly Muslim men, are transported in rented commercial jets to interrogation sites around the world known as black sites." Messages received are then animated along flight paths on a map featuring airports known to be involved in rendition flights. Viewers can scroll through these messages, as well as the various airports on the map. Touch and Go, by David Clark, Jeff Howard, Nick Rudnicki, and Shelley Simmons, takes a whimsical and playful view on the innumerable number of symbols and generic characters that you see throughout an airport. Touching one of the two arrows on the screen, you're taken on a quirky little narrated adventure with the "sign people", which brought about a lot of laughs and smiles from onlookers. The Terminal Zero One kiosk will be on display from now all the way until January 13, 2008 at level 3 of the departures level (pre-security) at Pearson International Airport's Terminal One.